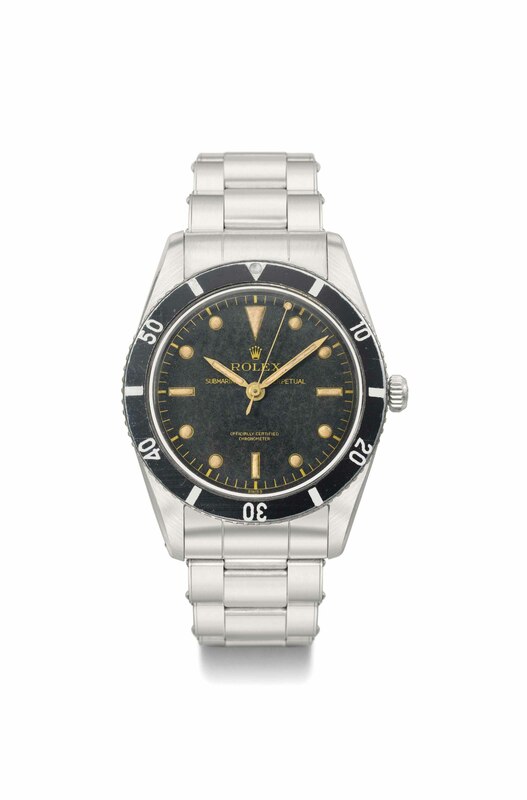 The present watch is a fine example of the rare Rolex reference 6204, the very first Submariner reference offered by the company, and only produced for a very short time. This particular watch features a beautifully aged dial with the rare "Submariner Perpetual" and "Officially Certified Chronometer" designations, as well as luminous material on the hands and hour markers that has aged to a warm golden tone. The original elongated slim hands are often referred to as "pencil hands" and the distinctive sweep centre seconds hand is known as a "lollipop hand", easily recognizable by its luminous dot at the tip without the pointed extension. The reference 6204 could either have a black matte dial, such as the present watch, or black honeycomb, and was available in two bezel versions, one without the minute graduation for the first 15 minutes, like the present watch, or with minute graduations for the first fifteen minutes. The bezel with minute graduation would later become a standard feature on successive models.